A great tasting all-rounder bar combining cutting edge sports nutrition with the taste of everyday confectionery. Combining 22.5 g of a special carbohydrate mix with 10g of protein to ensure long lasting energy. Each bar is 55g. Eat one bar per day. Use 1-2 hours before or after exercise with 200 - 400ml of water or other liquid. Use in conjunction with appropriate physical training or exercise program. Compound Chocolate (20%) [Sugar, Vegetable Fat, Fat-reduced Cocoa Powder, Protein-Enriched Whey Powder (Milk), Skimmed Milk Powder, Soy Lecithin, Emulsifier (476), Flavour], Caramel (15%) [Wheat Glucose Fructose Syrup, Sugar, Vegetable Fat, Sweetened Condensed Skimmed Milk, Butter Oil (Milk), Emulsifiers (407, 471), Salt, Flavour], Wheat Glucose Syrup, Milk Solids, Maltitol Syrup, Humectant (Glycerol), Soy Protein Crisps [Soy Protein, Tapioca Starch, Salt], Invert Sugar Syrup, Oat Fibre, Peanut Butter (4%), Soy Protein, Peanuts (4%), Peanut Flour (4%), Inulin, Maltodextrin, Vitamins [Ascorbic Acid (Vitamin C), dl-alpha Tocopheryl Acetate (Vitamin E), Niacinamide (Niacin), Pyridoxine Hydrochloride (Vitamin B6), Riboflavin (Vitamin B2), Thiamin Hydrochloride (Vitamin B1), Cyanocobalamin (Vitamin B12)], Calcium Carbonate, Salt, Magnesium Carbonate, Emulsifier (Soy Lecithin). 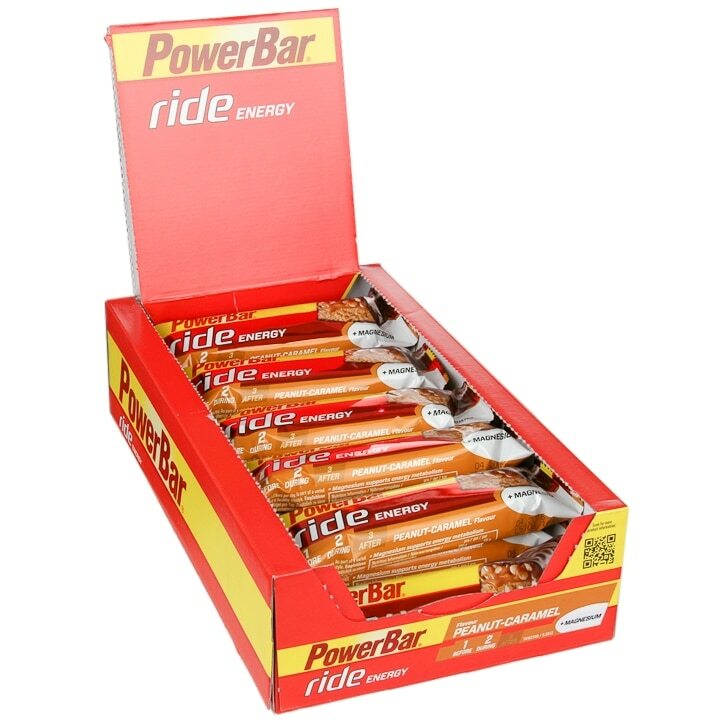 Powerbar Ride Peanut & Caramel Bar is rated 4.6 out of 5 by 14. Rated 3 out of 5 by Zippychap from not impressed This bar says it is intended for pre-ride and during ride energy. It's OK, but for my tastes, it is no better than using any high street chocolate bar. Basically, it's nothing special, and in future I'll stick to the "Energize" Power bars that are much better for serious cycling. Rated 5 out of 5 by DinkyPrincess from Delicious Almost as good as a regular Snickers. So tasty. Great pre or post workout. Rated 4 out of 5 by ColinH from Tasty and satisfying Surprisingly filling bar which obviously attempts to mimic a Snickers bar and in some ways is better. It has a darker chocolate which is less sweet but I would've liked to see more peanuts. Rated 5 out of 5 by Anonymous from Yum! My favourite of all the protein bars. It tastes good and delivers the right amount of energy. Great!